This document describes how you can take full advantage of Splunk's analytics and visualization capabilities and unique ability to process big data. With the ability to search and process known and unknown threats, you can use Splunk as your "primary security data interface." 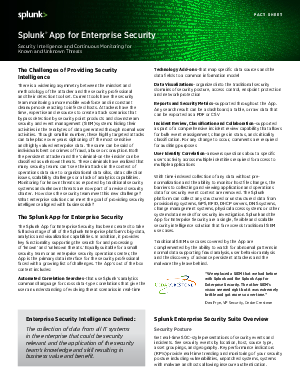 Splunk and the App for Enterprise Security are equally suitable for a small security team or an enterprise security operations center. See how the application's out-of-box features are helping today's security teams faced with a growing list of challenges and threats.